A curling iron is a rod that is electrically heated and used to style hair. A curling iron has the ability to take flat thin hair and give it body and a wavy or curly look. A curling iron can take naturally curly hair and take the frizz out and give you better control. Regardless of the natural texture or body in your hair you will be able to get a professional style of your choice with the use of a curling iron. Curls come in all shapes and sizes. Whether your curls are natural or homemade, there’s a tool to enhance or make every type of spiral, on every type of hair. Curling irons are the most commonly used curling tool. They are designed with a high temperature and a wand or barrel that is wrapped around a person’s hair for various periods of time to create a curled shape. Any size curl can be created depending on the size and style of the curling iron being used. Curling irons have been around for decades and are more popular than ever today. They come in a number of shapes and sizes but all operate essentially the same way. Advances in curling iron design have made them faster and more efficient than ever before. Tight curls can be created with a small straight wand, where large wands will create a wavy look. Some irons have clamps and others are clipless in design, which impact the hair differently. Regardless of the type of hair you have and whether the hair is naturally curly or straight, there is a curling iron available that can help you create curls you have always wanted or tame the curls you have naturally. The Xtava Satin Wave Five In One Curler curling iron set is the top pick because is has a full range of interchangeable wands for any hair style or type. This unique feature allows one curling iron to meet all your curling needs. If you want tight curls for a night out or wavy curls for the office, both can be accomplished with the same set. Now you don’t need to own several curlers to meet your needs. The set includes five different rods that can each be attached to the base and sole heating element of this cosmetic kit. Each rod with its own special features. The interchangeable rods increase in size providing five different styles of curls from one set. The larger rods feature clamps to hold the larger amounts of hair steady while the hair heats up. The smaller rods are clipless giving you more control over the smaller portions of hair during the heating and curling process. The barrels range in size from 0.3 inches to 1.25 inches. The Xtava Satin Wave Five In One Curler curling iron set also features a rapid-heat technology which heats up in a matter of seconds and maintains a constant preset temperature of 410 degrees Fahrenheit. Another unique quality of the Xtava set is that it is travel friendly. The removable rods make the set compact and easy to store and carry. It is also equipped with universal duel voltage and an eight foot cord, making them a breeze to plug into multiple types of outlets. The swivel cord that has a range of motion of 360 degrees giving you a convenient tool to work with at any angle. They set can be stored in a heat resistant bag which is included. The Conair Infinity Pro Curl Secret Curling Iron was selected as a top pick due to its unique and effective curling methods and variety of features. This curling iron is equipped with tourmaline ceramic technology to reduce frizz, tame fly aways. It is also designed to reduce damage to hair due to the hot temperatures required in a curling iron. This unit works great with thin or fine hair who want to add natural looking curls or tame the curls already in place. The Conair Infinity Pro Curl Secret Curling Iron comes with two different heat settings, with the highest temperature at 400 degrees Fahrenheit. At this temperature curls set better and will last longer than found in lower temperature applications. The curling iron contains a brushless motor that will give you styling precision not found in most other irons. The application will not create tangles in your hair, even when working with long or thick strands. It includes an instant heat up feature and maintains the temperature throughout your use. There is a timer with three different settings and a sleep mode for auto power reduction when the iron is left plugged in but not in use. This curling iron will give you long lasting and perfect looking curls. Revlon 3X Ceramic Tapered Curling Wand is a top pick because of its effective curling abilities and unique ceramic technology. Ceramic technology gives you a salon finish and smooth hair with no fly aways or frizzing. The Revlon 3X Ceramic Tapered Curling Wand has a PTC heater which maintains a constant temperature during use to give you consistent curls from beginning to end. Another useful features is the sixty minute automatic shut off function. If you are in a hurry or leave your curling iron unattended it will turn off automatically prevent accidents due to the high heat. This iron has a one inch barrel and tapers to a half an inch at the end of the barrel. You are able to create tight or loose curls by adjusting how tightly you wind your hair and what part of the barrel you focus on. The tapered barrel also allows for softer curls around your face. This unique feature allows you to form a variety of different size curls without having to use several different rods. 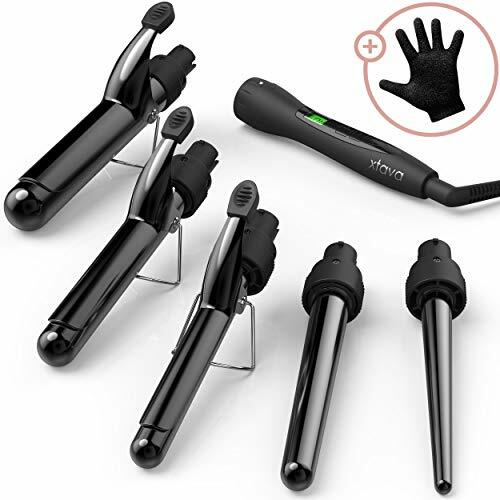 This curling iron is also equipped with an LED light which makes it easy to see if the wand is on or off and the buttons and functions easy to read. The Revlon 3X Ceramic Tapered Curling Wand also comes with a lifetime warranty. Curling irons are versatile products and can work with all types of hair thickness and textures. The The Xtava Satin Wave is the most versatile of the three because it includes five different wand sizes including both camp and clipless designs. This means no matter what your hair looks and feels like this iron will be able to help you manage and style your hair. 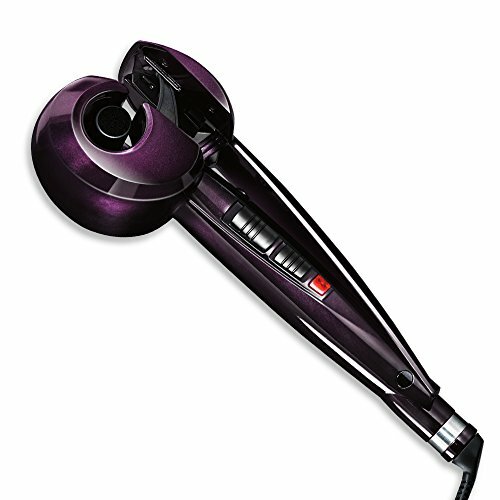 The Conair Infinity Pro is unique in that it contains a motor on the wand giving you more precision and reduces frizzy hair that can sometimes be created when hair is overheated. The Conair also offers two temperature settings so you can adjust based on the thickness of your hair. The Revlon 3X Ceramic Tapered Curling Wand is the most compact and features a clipless barrel that has a ceramic design to reduce stress on hair and leave you with perfect curls. 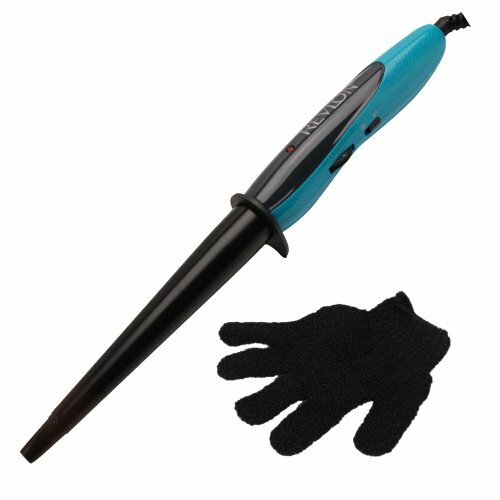 Each of these designs will work on all types of hair and are specifically designed to heat up quickly and maintain a steady temperature throughout use. They also have the heat and power to give you the look you want through the process of curling your hair. When looking for a curling iron there are a number of factors which will determine which is the best curling iron for your needs. What type of hair do you have? Hair texture impacts the way curls take in your hair and the amount of heat required to effectively create beautiful curls. Thinner hair does not require the same time and heat temperatures as hair that is thicker. Thinning hair can be damaged by high heat, whereas thicker hair won’t be effectively curled without it. Thicker hair requires higher temperatures and it must set in the iron for a longer time in order to hold the curl effectively. The heaviness of the hair will also impact how long the curls are able to stay in place. What is your hair length? The length of your hair will play a part in your decision on what type and style of curls you are looking for. Short, medium and long hair have different needs when it comes to what looks best with your face and what your styling goals are. Short to medium length hair can take tighter curls, where longer hair is better for bigger curls and a wavier look. Longer hair weighs more and the tighter curls will pull out faster. Those with medium length hair have a full range of style that can be enjoyed with a curling iron. What style curls are you looking for. Curling irons can product everything from soft light wavy hair to tight spiral, Shirley Temple, curls and everything in between. Your choice of style and size of curls will determine the curling iron that will meet those needs the best. Finding the right barrel size will help give you the perfect curls. There is a styling guide below that will help you determine the right curls for your hair length and the right barrel to give you the look you want. What is the shape of your face? Your facial shape will effect what hair styles look best on you. Faces can be square, oval, round or triangular. Curls are able to soften sharp facial features and highlight your favorite feature depending on the curling style you choose. Type of Curling Iron. Curling irons can come with springs or clips which hold the hair in place while you curl. Clipless irons do not have a clamp built in to hold the hair in place as it is rolled. Spring action irons have the widest range of barrel sizes and are the easiest to use. Clipless designs do not leave creases in your hair and is less likely to damage hair ends. Using this style generally requires using a heat proof glove to prevent burning yourself. Double and triple barrels are also available and they create specialty waves that are wavy rather than curly. What Size Barrel Should You Use. Barrel size is essential for getting the right style as the barrel determines the tightness or looseness of the curl. For shorter or layers hair you will want a smaller barrel so the length of your hair can wrap around the barrel adequately. A maximum of I inch should be used depending on the tightness of the curl you are looking for. Interchangeable barrels give you the ability to change widths and create different hair styles. Ceramic irons which heat up very quickly and maintain an even temperature from start to finish so you have the same temperature on both the first and the last strand of hair. It also prevents damage to hair due to hot spots. Tourmaline creates smooth and glossy hair and is used in many professional settings. This maintains temperatures well and reduce fizziness in your hair. Titanium offers an even heat distribution across the iron and will not snag your hair. Inexpensive irons can end up knotting your hair as it is wound around the wand. Titanium prevents tangles because it is a very smooth surface that will not catch the end of your hair. What Temperature Control is Offered? The temperature is important because an iron that is too hot can damage or burn the hair, where one that is too cool will not effectively curl your hair. The ability to adjust the temperature will allow you to set it based on your personal hair and what works best. What is the Right Barrel? Based on the size curls you want will depend on the barrel size you choose. Pencil Thin curls are best for short to medium length hair and are most effectively created using a 3/8 inch barrel. Ringlet curls are best for short to medium length hair and work best with a ½ inch to 5/8 inch barrel. Coil curls are a classic style curl that works well on medium length hair and a 1 inch barrel. This can be accomplished with a spring or clipless wand. Looping curls are best on medium or long hair and need a larger barrel size of 1 ¼ inch to style effectively. Round curls work wonders on medium to long hair and are best with barrel sizes of 1 ½ inch or larger. Clipless curling irons handles the length better and creates beautiful wavy hair. Much of the design choice for curling irons have to do with your personal preferences and the natural body your hair has. Is it straight or already curly? Do you have thin or thick hair and is it fine or coarse? Then decide what you want your hair to look like. Consider the shape of your face and the current styles. Curling irons are able to create beautiful flowing hair in a very short period of time. Add some gel or hair spray and it is a look that you can enjoy all day.